Preparations for salvaging the barge that capsized in San Francisco Bay earlier this month began Wednesday, U.S. Coast Guard officials said. 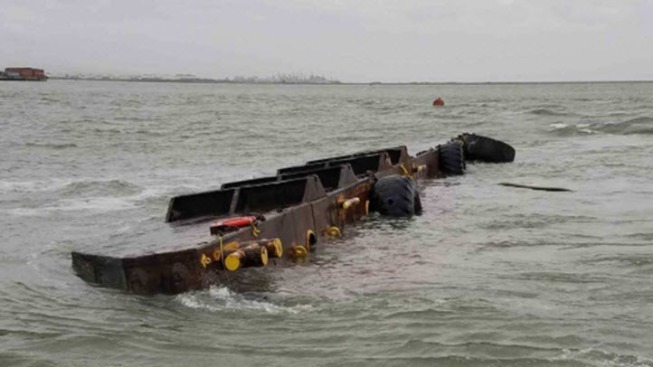 The 112-foot freight barge Vengeance capsized on April 7 south of the Bay Bridge and settled above the subterranean BART Transbay Tube, which is protected by a 25- to 30-foot layer of earth, according to Coast Guard officials. On Wednesday, Global Diving and Salvage began preparations to rotate the barge upright on the sea floor, an operation called a parbuckle. Preparations for the parbuckle may take several weeks and will involve divers rigging anchors to the sea floor and to the barge. Once all components have been rigged, tension will gradually be applied to the anchors to rotate the barge upright. Information gathered during the operation will support development of a plan to refloat and tow the barge to a facility for fuel removal. "Our goal with this operation is to mitigate any environmental threat posed by the fuel remaining on the Vengeance while protecting the subterranean BART Transbay Tube and ensuring the safety of responders and the public," Coast Guard Chief Warrant Officer Jeremiah Winston said in a statement. Mariners in the area are asked to abide by the 350-meter safety zone and to monitor local media channels since the safety zone is subject to change, Coast Guard officials said.